« Still Thinking of Applying for a PhD Place in Physics or Astronomy? Regular readers of this blog (Sid and Doris Bonkers) will know that I currently reside in an area of Cardiff known as Pontcanna, which is part of the administrative district of the city known as Riverside. Although Pontcanna does have a distinct identity as a community, there’s no precise definition that I can find of exactly where it is. Even Cardiff City Council doesn’t really recognize its existence: all my official mail has “Riverside” in the address. Although I tell everyone I live in Pontcanna, I don’t have any official evidence that I do! I’ve also often wondered about the origin of the name, as it definitely suggests a bridge of some sort (Pont is Welsh for bridge, cf the French) and there are no bridges in the area. The name Canna is generally taken to refer to Saint Canna, whose name is also associated with Canton, an area of modern Cardiff adjacent to Riverside but until the 19th Century a village in its own right. Since this is a very old name it’s logical to infer that the bridge is no more. 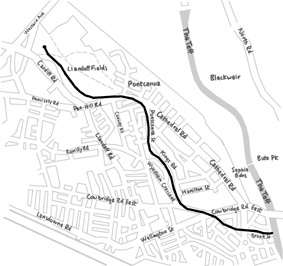 However, the thing that always puzzled me is that the area of Pontcanna is actually quite small, and actually not all that close to the River Taff (the main river through Cardiff), which is even further from Canton, so there’s no obvious site for a bridge to have been, even if the bridge itself is long gone. A chance conversation in a pub the other day however led me to a website that offers a solution to this conundrum., namely that the “Pont” in Pontcanna does not relate to a bridge over the River Taff, but over a small brook that used to run through the area shown on old maps and known (in English) as the “White House Brook”. This interpretation also casts doubt on the idea that “Canna” has anything to do with Saint Canna: it is possible that it derives instead from an old Welsh verb meaning “to whiten” although I’m by no means confident in that. The River Taff can be seen to the upper right of the modern map. The White House Brook ran down what is now Cathedral Road before turning along the route of what is now Pontcanna Street. Construction of the large houses on Cathedral Road, and others on surrounding streets, began around 1896, at a time when Cardiff’s population was expanding rapidly. Prior to that this area was mainly farmland, with a few cottages here and there. It is also part of the River Taff flood plain and was criss-crossed with ditches containing small streams, of which the White House Brook was the largest. As the area became developed, water from these streams was diverted to form the sewer system for the new buildings and the White House Brook progressively dried up. What little remains of it now runs in a culvert, which eventually empties into the Taff. The “Pont-cana cottages” (sic) were also demolished to make way for the new houses on Cathedral road and new roads either side of it. The best guess for the site of the bridge is close to the junction between Teilo Street and Cathedral Road. Note that in the first map, Pontcanna is marked to the River Taff side of Cathedral road which is probably where the bridge was situated, very close to the end of my street. 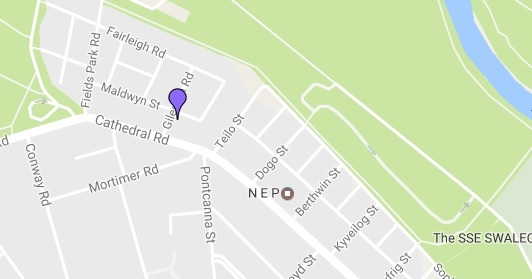 I feel more justified than ever in saying that I live in Pontcanna! P.S. This map also shows another location marked “Pont-cana” to the North, on what are now called Llandaff Fields. I think refers to Pontcanna Farm, presumably named after the bridge. Perhaps the Pontcanna cottages may have been homes for farm workers? P.P.S. Incidentally, I learned from this site that until 1858, Cathedral Road was only accessible by paying a toll at a booth on Cowbridge Road! Even in the old days, Pontcanna was an exlusive area! This entry was posted on January 10, 2017 at 11:49 am and is filed under Cardiff, History with tags Cardiff, Pontcanna. You can follow any responses to this entry through the RSS 2.0 feed. You can leave a response, or trackback from your own site. The Welsh name for Canton is Treganna, which shows Canna more clearly: Tre is a shortened form of tref meaning town. Canna is softened to Ganna after Tref which is a singular feminime noun. I understand there are some old spellings of Pontcanna as Pontganna because pont (bridge) is also a singular feminine noun. There are online maps of the area which show streams. For example, this 1886 Ordnance Survey one-mile-to-six-inches map digitised at the National Library of Scotland. That’s a very interesting map. It shows that Mortimer Road already existed in 1886. Pontcanna Street was apparently not built until after this date. The site of the bridge appears to have been at one end of the row of “Pont-Canna Cottages”. The surveying was, of course, carried out several years before the map’s publication, which can make it a little difficult to put tight constraints on when buildings were constructed. But the map does provide some useful constraints. Here is an Ordnance Survey 1:500 map from 1880 at the Old Maps website (zoom out to get a visible version and move it to show areas of interest). Both these maps show that around this time only one side of Mortimer Road had houses on it! That makes sense as the houses opposite mine clearly have a different style. I see. You live near Mortimer Road? ‘Can’ is a Welsh word for white (also bright or brilliant), often used to mean bleach or ‘cannu’ to bleach. Some parts of Wales use ‘can’ for flour. I live in Mortimer Rd. and have what I believe is an old well under the rear of my house. It’s about 12′ deep and is lined with pebbles. I’ve always thought that the bridge was either up by Pontcanna Farm, at the row of cottages you mentioned or at the Penhill junction on the fields side, however I think most of that has been websites I’ve seen over the years or hearsay. I’ve never seen a stream or tributary marked a map though in the area, which seems unlikely to have been missed off if it existed. The municipal and parish border which runs roughly where you describe the stream as running, down Pontcanna Street could well have been defined by a stream, however I would have thought there might have been other drivers for the position of the boundary including ownership of land and main roads etc.